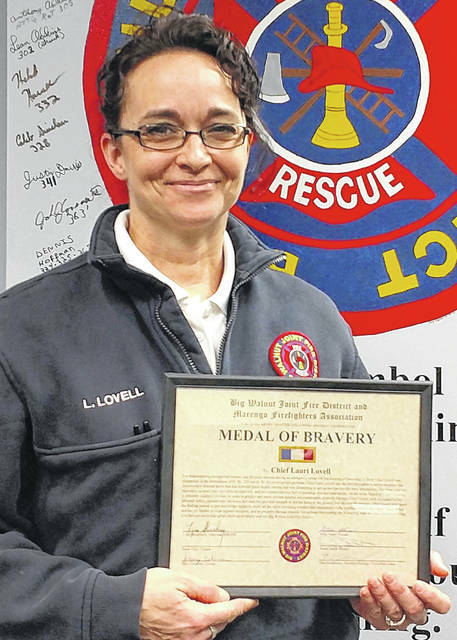 The Big Walnut Joint Fire District presented Chief Lauri Lovell with the Medal of Bravery for demonstrating exceptional bravery and physical stamina during an emergency scene last month. MARENGO — The Big Walnut Joint Fire District presented Chief Lauri Lovell with the Medal of Bravery for demonstrating exceptional bravery and physical stamina during an emergency scene. On the evening of Dec. 3, 2018, Lovell was dispatched to the intersection of State Routes 229 and 61 on an animal problem. Lovell was the first firefighter to arrive on scene. She discovered a downed horse that had suffered grave bodily trauma that was attempting to get up and run into the busy intersection, a news release from BWJFD states. The scene was very hazardous as there was very little daylight left, and the intersection was full of speeding cars and semi-trucks. As the horse flailed in a state of panic, it seriously injured a civilian. In order to prevent any more civilian injuries and catastrophic property damage, Lovell, with no regard for her personal safety, jumped onto the horse and used her physical strength to pin the horse to the ground. For the next 90 minutes, Lovell held down the flailing animal to prevent further injury to itself, all the while providing comfort and reassurance to the terrified animal. As a direct result of her actions, no further injuries occurred, and there was no property damage.